Lord of the Rings quote badge - My Precious. 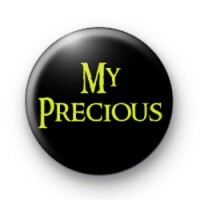 Black badge with yellow writing, perfect for any Gollum fans and LOTR geeks. Standard 25mm badge. We have more Lord of the rings themed badges, have a search or browse through our Movie & TV Badge category.